We made our Gingerbread soap and then used cookie cutters to cut out uniquely shaped bars. These are small enough for little hands to use, and because our biodegradable wrapping helps prevent the scent from spreading, it can be used as a stocking stuffer too! This soap lathers well and leaves your skin feeling moisturized. The scent is just like the cookie- nutmeg and clove! Ingredients: Saponified Olive, Coconut and Palm Oils, Cocoa Butter, Clove, Cinnamon, and Nutmeg Spices, Clove Organic Essential Oil. These cute little snowflakes smell like peppermint and sparkle in the sunshine! We added some blue colored mica for colored swirls. These bars are great for little hands and because our biodegradable packaging helps to prevent scent spreading, they can even be used as stocking stuffers! Expect fluffy bubbles that won't dry your skin and a hint, not too strong, of peppermint! Our white Peppermint Snowflakes are a fun way to get clean! Expect big, fluffy bubbles a burst of Peppermint scent from our organic essential oil. These snowflakes are great for small hands to grip, and thanks to our biodegradable packaging, you can even use them as a stocking stuffer as the scent doesn't bleed through! It may be called Baby Bar, but don't let the name fool you- it's for everyone! Super rich, wonderfully lathering it leaves your skin soft like a baby's! And with a short list of ingredients you can actually pronounce and recognize, and with no fragrances or anything harsh added to it, you can use it on your actual baby, too! Ingredients: Distilled Water, Coconut Oil, Palm Oil, Food Grade Sodium Hydroxide(lye), Avocado Oil, Sweet Almond Oil, Jojoba Oil, Shea Butter. Bamboo charcoal is known for skin clarifying qualities. We mixed it with a moisturizing bar and added essential oils that are also good for the skin. Expect a fresh earthy scent and black lather! Ingredients: Olive Oil, Coconut Oil, Distilled Water, Palm Oil, Food Grade Sodium Hydoxide(lye), bamboo charcoal, organic rosemary and lemongrass essential oils. The fresh scent of peppermint essential oil plus the delicious smell of your favorite coffee! Expect thick, fluffy lather and a bar that will leave your skin moisturized, not feeling tight. We used locally sourced coffee and chocolate to make this bar extra special. Each batch of soap is handcrafted in small batches, so each bar will be unique! 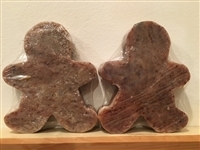 Ingredients: Saponified Olive, Coconut, and Palm Oils, locally sourced lard (Ironstone Creamery), Organic Cocoa Butter, Coffee (Backyard Beans), Bittersweet Chocolate (Joanne's Candy Kitchen), Cocoa Powder, Organic Peppermint Essential Oil. This bar has a deep brown color thanks to the locally sourced honey! Expect a gentle exfoliation and a gentle soap with a rich lather. It will leave your skin smooth and moisturized thanks to the milk as well as the honey. This bar lathers nicely and has no added essential oil- just the warm scent of honey comes through! Ingredients: Saponified Olive, Coconut, and Palm Oils, Locally sourced Lard (thanks Ironstone Creamery! ), local Raw Milk (Ray's Greenhouse), Oats, locally sourced Honey(King's Bees). Made with locally sourced raw milk. Moisturizing and gentle, with a fabulous lather! Milk is easily absorbed by the skin and is excellent for sensitive skin. This bar has the added benefit of organic lavender essential oil. Ingredients: Olive Oil, Coconut Oil, Distilled Water, Palm Oil, Food Grade Sodium Hydoxide(lye), organic orange and tea tree essential oils. This soap is a new twist on an old favorite! We took our fabulous New Moon bar, shredded it, and added Cedarwood essential oils and chunks of our other soap. The result is a wonderfully smelling soap that looks like rock and lathers black! Ingredients: Olive Oil, Coconut Oil, Distilled Water, Palm Oil, Food Grade Sodium Hydoxide(lye), bamboo charcoal, organic rosemary, lemongrass and cedarwood essential oils. This bar provides a wonderful feeling lather- foamy, rich and dense! The clay is suspended in the foam providing a very mild exfoliation and a great "slip" feeling. This bar makes a fabulous facial bar thanks to the Kaolin Clay and the French Green Clay- or use in the shower for an at-home spa experience! The scent is slightly floral, but is considered gender neutral. Ingredients: saponified Olive, Coconut and Palm Oils, Distilled Water, Cocoa Butter, Kaolin Blush Clay, French Green Clay, Bamboo Charcoal, Organic Patchouli, Cedar Wood, Orange, and Rose Geranium Essential oils. This bar is our wonderful Olive Oil recipe- so expect big bubbles and moisturized skin! First we made the black and white soap, shaved it into thin layers and used it as the outside plus the embeds for the pink batch of soap! The black and white bar was scented with organic Grapefruit, Lime and Frankincense essential oil and the pink is Ylang Ylang, Orange and Lavender. The mixture is fruity and sweet without being too intense. This bar is particularly gentle and moisturizing. Goat's milk soap has a thick, creamy lather with a PH close to your skin. Carrots provide extra vitamins as well as a beautiful orange color. Our goat's milk is from a local farmer, Amazing Acres Goat Dairy, and our carrots are from Kimberton CSA. The beautiful pencil line is cocoa powder from Joanne's Candy Kitchen. I love working with out local venders who are also a part of the Lansdale Farmers' Market! The scent of this bar comes from organic essential oils- expect a subtle, gender neutral scent that has sweet hints of lemon and earthy tones of cedarwood and patchouli. Ingredients: Saponified olive, coconut and palm oils, locally sourced lard, goats milk, carrots, organic lemon, lemongrass, cedarwood and patchouli essential oils, cocoa powder.